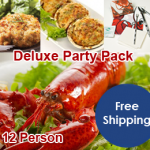 Our Deluxe Party Pack for 6 includes our delicious “stuffies,” “crab cakes,” and large lobsters with cracker kits. 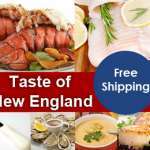 We bring you the best tasting lobsters and seafood, right to your door. This limited time special, also includes FREE shipping. • 6 of our classic stuffed quahogs, or “Stuffies” as we call them in the Northeast, which are loaded with our sweet, tender surf clams. • 6 of our Classic Crabcakes which are bursting with Maryland blue crab meat and a unique combination of spices that we are sure you will love! This limited time special, also includes FREE shipping. 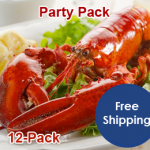 Live lobsters shipped right to your door.